Currently on view in The Robert F. Lange Foundation Gallery until Aug. 26 is the exhibition Word and Image: Textual References in Japanese Abstract Prints, which features various prints from 20th century Japanese print artist and former kamikaze pilot Maki Haku. The late artist’s work is distinguishable by its bold, minimalist aesthetic. 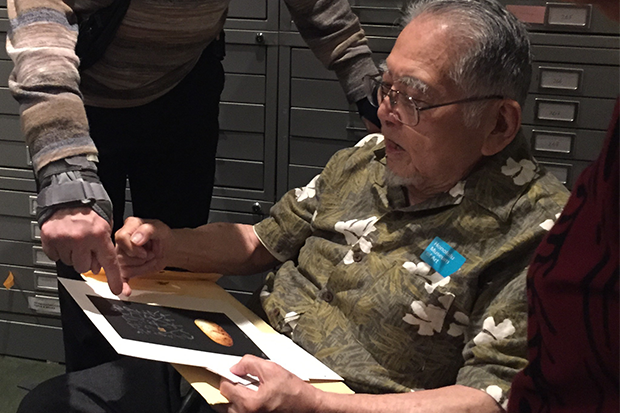 We can thank James Imai, an old friend of Maki Haku, for the artworks on display in the exhibition. 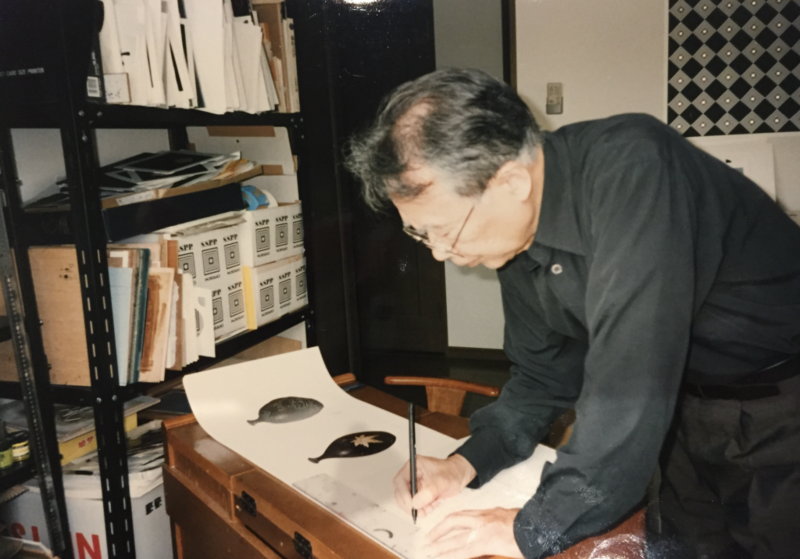 Imai has donated many Maki Haku pieces to the museum and continues to do so, most recently donating 28 works. 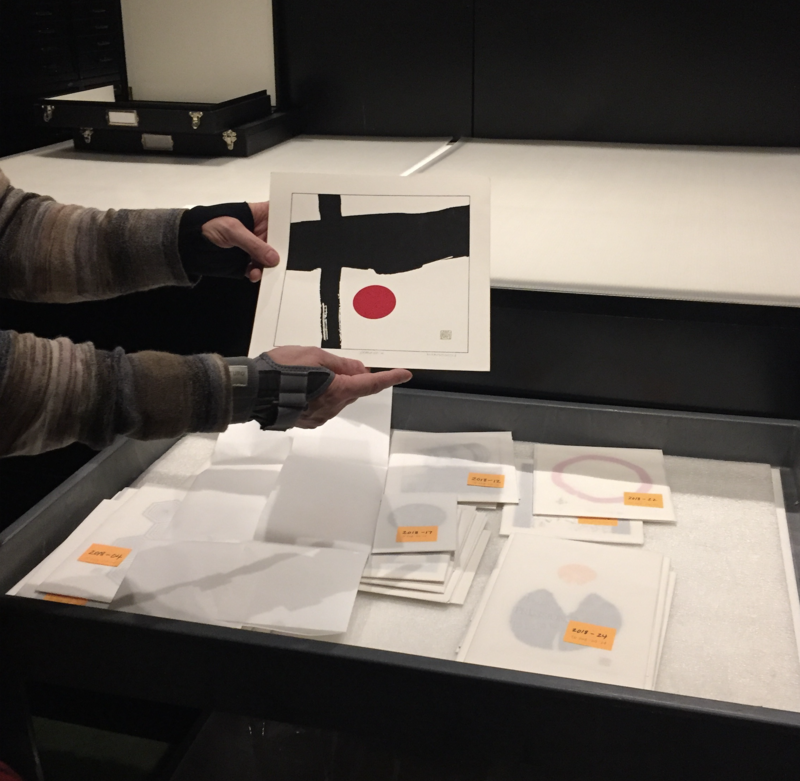 Imai started purchasing Maki prints from the Yoseido Gallery in Tokyo and the Red Lantern Gallery in Kyoto in the early 1970s. As a big fan of his work, Imai became interested in meeting the artist in person. In 1973, he had the chance—thanks to the help of Yoshio Kojima, President of Busicom Corporation at the time, and Nobuhiro Jitsukawa, owner of the Jiyugaoka Gallery in Tokyo. Kojima kindly took Imai to Maki Haku’s home, where he did all his work. Imai and Maki Haku struck up a friendship, taking family trips together—like to the Grand Canyon—and visiting each other when in the USA and Japan. A 1996 photo of Maki Haku in action by Imai. With impeccable timing (given the exhibition run-time), the museum and Robert F. Lange curator of Japanese art Stephen Salel recently welcomed Imai and his family for lunch at the Café and a visit to the Asian art vault to look through the most recent donation. First up were some abstract Maki Haku prints featuring cross-like shapes balanced with a red circle. Imai interpreted the crosses as the artist, who died of stomach cancer in 2000, exploring religion and wanting to go to heaven. The same hypothesis goes for this 1999 washi paper print of a boat. “[Maki Haku’s] journey to heaven is my interpretation,” Imai said. 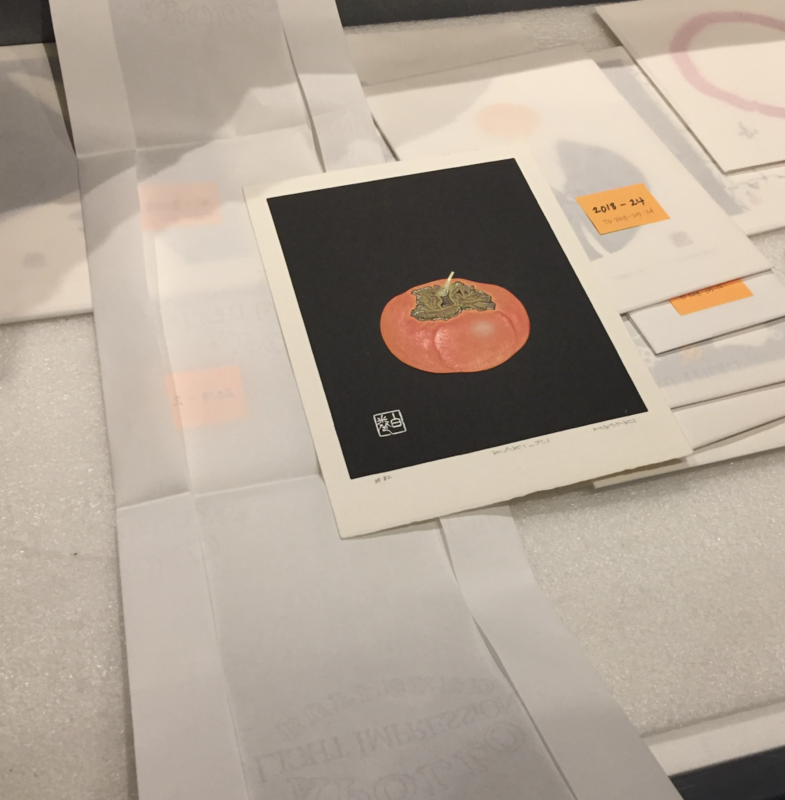 There were also some classic Maki Haku subjects featured in the donation, like this persimmon print from the 90s—a quintessential Japanese symbol. Other prints featured different edible subjects, like cherries and yams. Imai also donated some holiday cards commissioned by the artist to help ring in the New Year in the late 70s and early 80s. One of Imai’s guests in attendance revealed she was a lucky recipient of such a beautiful New Year’s card. “He did stuff that no one knew,” Imai said as Salel went through the prints. 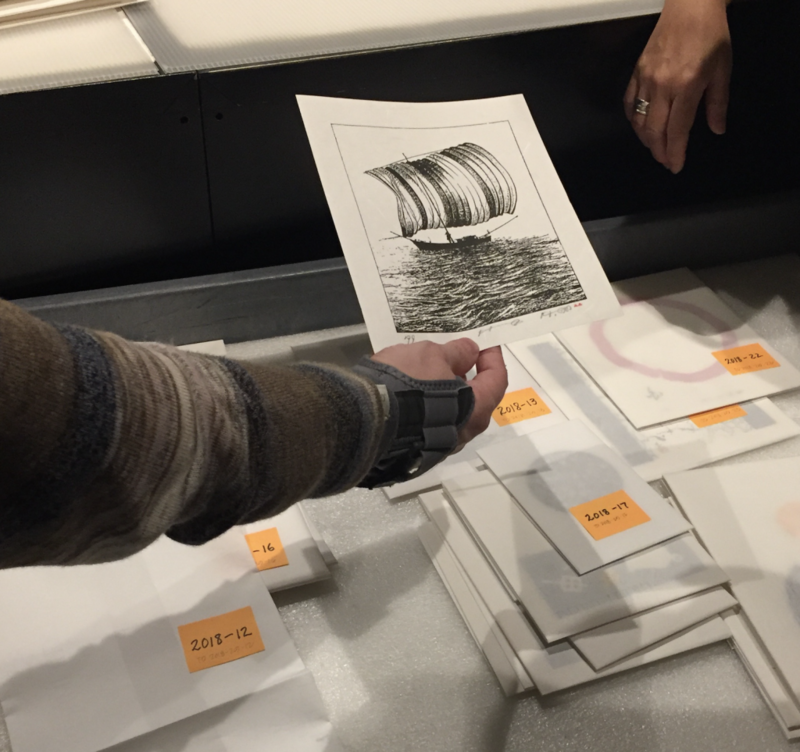 The 28 prints given to the museum are unique and each one tells a story of the artist’s last decade. 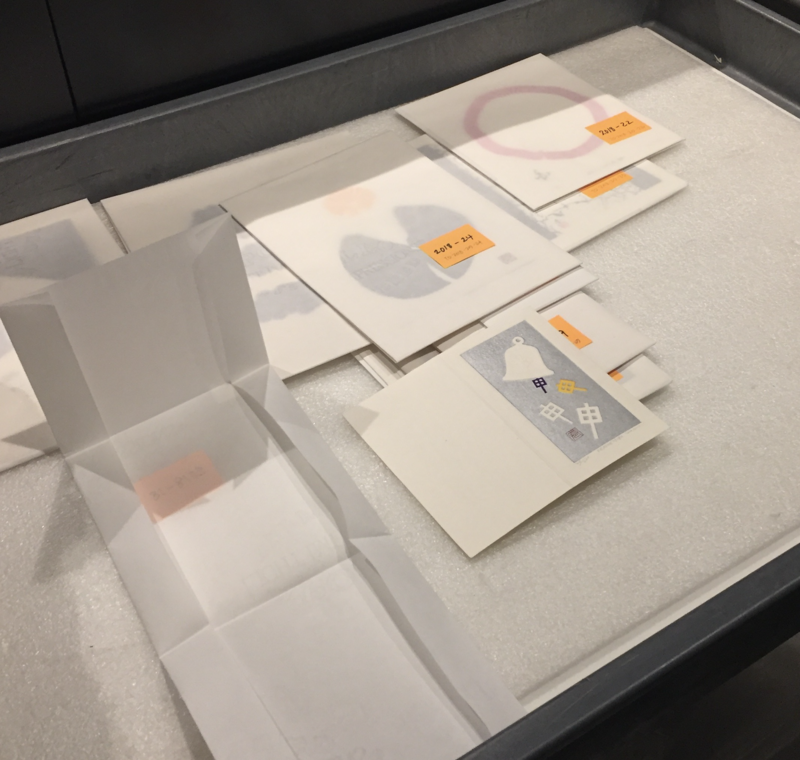 The museum is excited to share these prints with the public and is grateful for Imai’s continuing generosity.